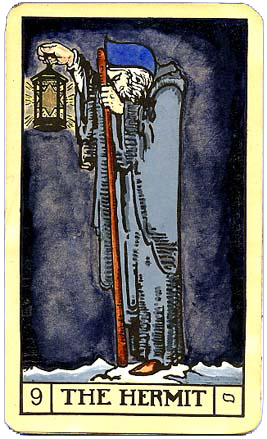 The Hermit holds the light for us to stay upon the path in times of darkness. He reminds us that our thoughts form our reality. He teaches us to make use of solitude to question our beliefs, to become conscious of universal cause–and-effect and to discern wholeness. Ruled by Mercury, The Hermit is associated with dedicated service, unconditional love and spiritual ecstasy. He is the figure of elder wisdom; an experienced guide, well versed in natural and spiritual law. The Hermit image on journals, T-shirts, and mugs.